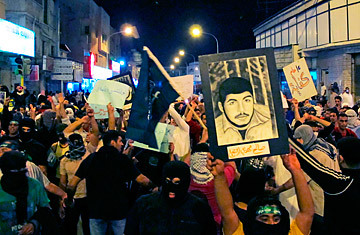 More than 100 mostly young men defied a ban on demonstrations in the main Shi'ite city of Qatif, Saudi Arabia, March 9th, 2011. An unprecedentedly bold call by Saudi activists for a "day of rage" on Friday fizzled, as citizens heeded a government ban on protests in the Kingdom whose aging rulers and allied religious establishment do not tolerate freedom of expression. The protest day passed quietly in the capital Riyadh, according to Eman al-Nafjan, a 32-year-old blogger, mother of three and postgraduate student who talked to TIME. A heavy security presence blanketed the city, she said, with checkpoints and patrols. She said at least six people had been detained at the Al Rajhi Mosque, site of last week's rare protests, following "an interruption" that "was contained quickly." Reuters reported that a helicopter circled over the mosque, in the eastern part of the city, while busloads of police waited nearby. More than 34,000 people had indicated support for the protest on an anti-government Facebook page created a few weeks ago. Protesters had planned to hold a second "day of rage" on March 20, but it's unclear if that will go ahead given Friday's poor turnout. Several small protests did take place in two towns in the oil-soaked Eastern Province, where most of the country's two million Shi'ites are concentrated. Several hundred people took to the streets, according to Ali al-Ahmed, the Saudi director of the Washington-based Institute for Gulf Affairs, despite the fact that police on Thursday fired rubber bullets to disperse about 200 protesters in one of the towns. The minority Shi'ite population complained of its disadvantaged status in this Sunni bastion, but its participation in these protests may also have hobbled them. "The government succeeded in using the sectarian card," Ahmed said, by playing on long-standing Sunni fears that the country's Shi'ites represent a fifth column in the service of Shi'ite Iran. "They made the day of rage into a Sunni-Shia thing." The protest calls are testing the rigid Kingdom's ability to adapt to the youth-led wind of change that has swept across the Arab world. The resultant surge in expectations may have rendered obsolete Riyadh's established method of responding to problems  by throwing money at them. The ailing King Abdullah's recent bid to insulate the kingdom from regional unrest by announcing a massive $36 billion package to increase salaries, reduce unemployment and provide affordable housing, while hailed in the state-run press, failed to impress many of those agitating for changes. The economic pressure in Saudi Arabia may be less intense than in some of the poorer countries in the region, with the oil rich kingdom functioning as a welfare state for its 25 million people by providing citizens with housing assistance, free healthcare and education. Still, some 70% of the population is younger than 30, and unemployment for people under 25 runs at 40%. Other factors fueling resentment include the lack of transparency about the monthly stipends and other benefits coughed up for the kingdom's estimated 7,000-8,000 princes. Women are not allowed to drive and can't travel abroad without the permission of a male relative. Then there are the fanatical religious police, or mutawwa'in, who beat people who are late to the five daily prayers and who, on March 11, 2002 forced young schoolgirls fleeing their burning building back into the inferno because they weren't wearing correct Islamic dress. Fourteen students died in the fire, prompting rare public criticism of the group. It's no accident that Saudi Arabia's "day of rage" fell on the same date. "The government gets only one part of this struggle, which (is) the economic factors, and fails to understand the other part about freedom, justice and participation," Ahmed al-Omran, a prominent 26-year-old Saudi blogger and Columbia University journalism student told TIME in an email interview. "The ruling elite, most of them in their eighties, are largely out of touch with their young population, and even when they move, they move too slowly to keep up with the youth aspirations." At least three petitions for change have been issued recently by different groups, each with hundreds of influential signatories. The demands are largely the same: a constitutional monarchy, the election of members of the Shura Council (a 150-member advisory body appointed by the king), an independent judiciary, freedom of assembly and expression, the release of political prisoners, the creation of an independent anti-corruption body, and a fixed monthly minimum wage of 10,000 riyals ($2,666). It's unclear if the government intends to heed demands for change. The founding members of the Islamic Umma party, a group recently set up despite an official ban on political parties, were arrested, and some remain in custody. Still, few are calling for the fall of the regime; most merely demand reform and accountability. King Abdullah remains popular. During his reign the aging monarch has opened up the kingdom, albeit just slightly, by allowing for landmark municipal elections in 2005 in which men were allowed to choose half the members of the local councils. (Women were not allowed to participate). He also inaugurated the country's first co-educational university, allowing men and women to attend classes together. In fact, the government has argued that protests are unnecessary because the king holds weekly consultations in which regular citizens can air their grievances. But for a globally connected generation of Saudis that holiday and study in Beirut, Paris and other foreign capitals, it may no longer be good enough to come back to a country that is still so closed off both from parts of itself and the wider world. "They are a ticking time bomb," Nafjan, the blogger and postgrad student, said of the 100,000 youth who since 2005 have studied abroad under the King Abdullah Scholarship Program. "The status quo, especially when it comes to women's rights, is impossible to maintain for long ... The call for change and more rights is loud." The House of Saud is resilient, however, and its massive oil wealth, coupled with its role as the Mideast's most powerful bulwark against Iran, ensure that its unlikely to lose the backing of its Western allies anytime soon. But if the events of the past two months have proved anything, it's the peril of predicting events in a quickly changing Middle East.